Alex Rodriguez joined the New York Yankees in February of 2004, departing the Texas Rangers in exchange for Alfonso Soriano and Joaquin Arias as he began a new chapter of his career in Yankee pinstripes. Rodriguez starred in his first season in the Bronx, crushing 36 home runs with 106 RBI, a .286 batting average, and a team-high 28 stolen bases. Rodriguez earned a spot in his eighth career American League All-Star team in 2004, his first of seven All-Star teams with the Yankees. 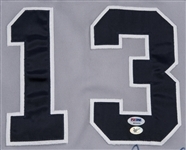 Offered in this lot is Rodriguez’s gray Yankees road jersey from the 2004 MLB All-Star Game at Minute Maid Park in Houston, Texas. Rodriguez started at third base for the Junior Circuit nine, collecting an RBI triple in the off Carlos Zambrano in the fourth inning that saw David Ortiz hustle from first to home on A-Rod’s three-bagger to Tal’s Hill in deep center. 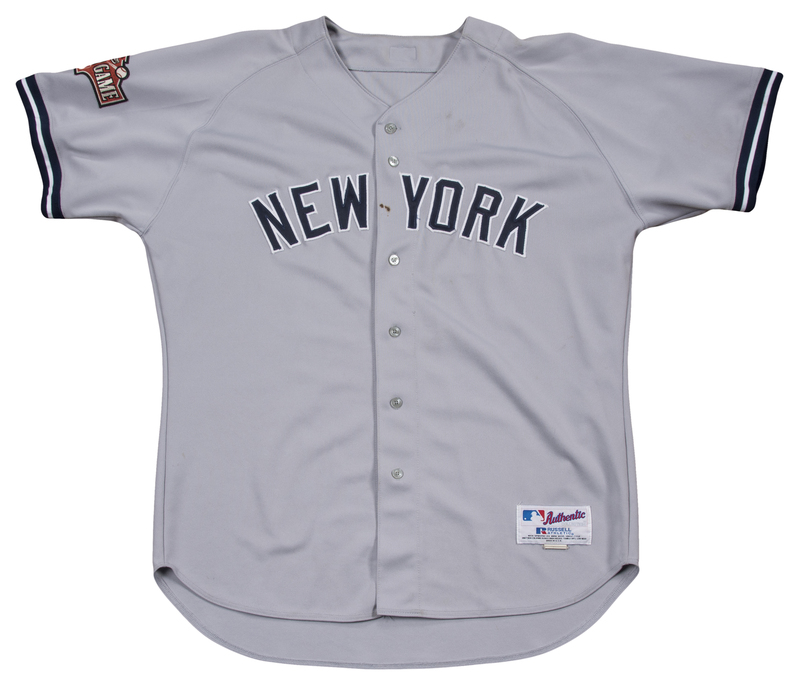 This button-down Yankees jersey has “NEW YORK” sewn across the chest in navy and white tackle twill. Rodriguez’s number “13” is sewn on the back of the jersey in navy and white tackle twill below a MLB logo patch. A 2004 All-Star Game patch is sewn on the right sleeve of this jersey. 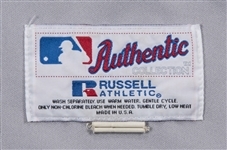 A Russell Athletic tag with attached size “50” and “+2[inch] Extra Length” flags is sewn on the front left tail. There is a small brown stain between the “W” and the “Y” on the front of this jersey. 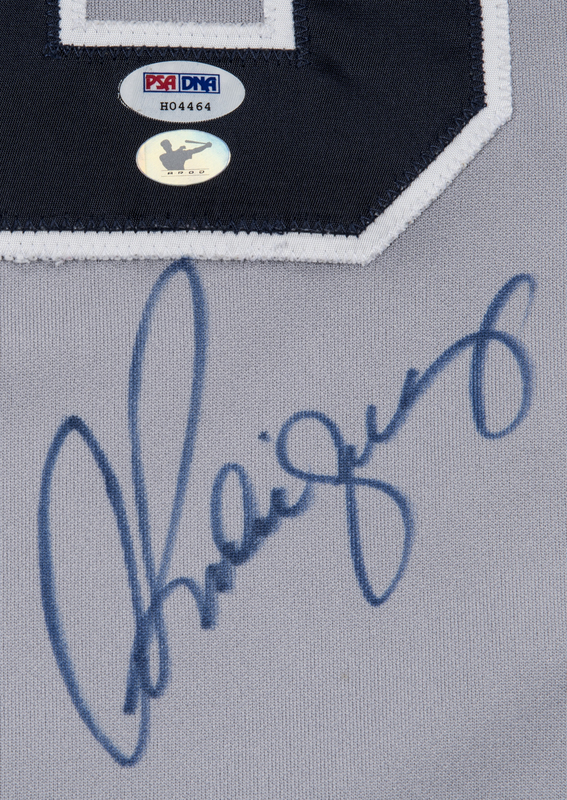 Rodriguez has signed the back of the jersey in blue marker. 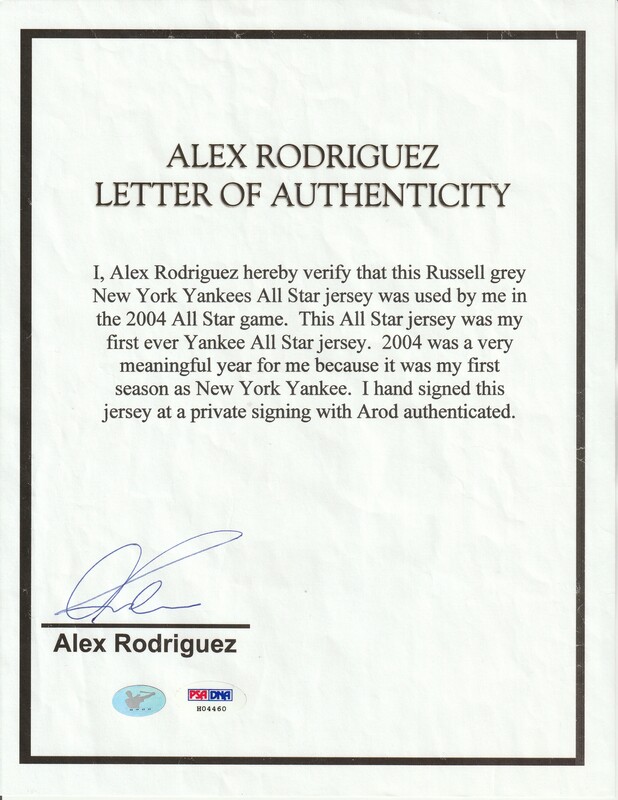 This historic All-Star Game jersey, Rodriguez’s first ever worn with the Yankees, is accompanied by a LOA signed by Rodriguez himself. Rodriguez’s signatures on the jersey (H04464) and LOA (H04460) come with a COA from PSA/DNA.